And so I have been away for a long time, or so it seems to me. Having been utterly obsessed with running and my new found love of it, a TWANG! in the area close to what is colloquially known as the “party palace” has meant I have been out of action for a conservative, and probably too short 10 days. The annoying this is that this is not a running injury. 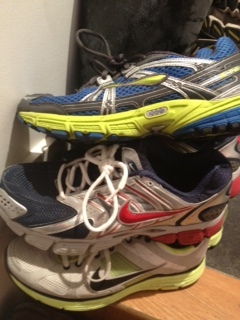 My shin splints were fixed with a change in gait. My knee was fixed with strengthening exercises. My loathing of running because it is so boring was fixed by excitement about perceived improvement, a decent playlist, and BLING! It was caused by the over-zealous following of the Adrian James 6 pack workout. Regardless of who’s to blame (Adrian!) this did mean that I decided to rest myself and to not attempt any heavy lifting, running, or abs (Adrian!) and fortunately coincided with a planned trip to beautiful Saxony. 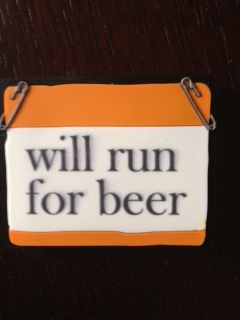 Of course, horse riding, mountains, copious amounts of beer, sausage, meat, cheese and bread did not stop me from wanting to run, and I did anything I could running related to keep up the momentum. This was my fear, that I would fall out of love with running and not go back, despite all the upcoming races. So what did I do instead? I got a fridge magnet. 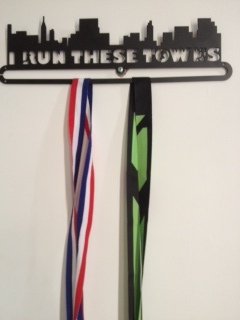 I got a new medal rack. 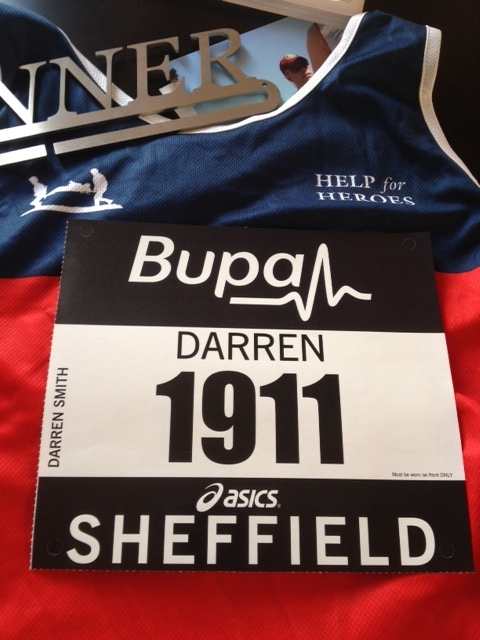 I received my BUPA Great Yorkshire Run number and chip. I looked at my ipod and saw this…. And this meant that I could a) only see a couple of my PBs and b) could only see a couple of incorrect Pbs. My K time in about 4.50 and my mile is 8.20 at the moment. I use the application. I use the application using Ipod not Iphone. They didn’t seem to get that. 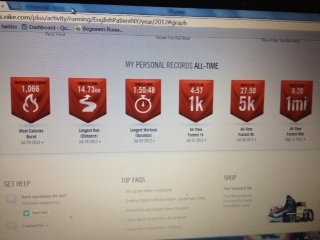 …best 1K, best 1 mile, best 5k, longest distance and time. No 10K. I mail again. They tell me to reboot my ipod. I do this. I mail again. They tell me that to record a 10K PB I need to run 10K. 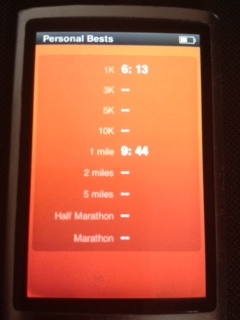 My present average is 10.2K, meaning that I have run more 10K+ runs than not. it all went quiet since. For the month of September see how much I improve. Do this in a contest against others. And whoever makes the greatest improvement in the month of September wins. I do not know what they win yet. Maybe in Oct we will make a prize as I am in London and I don’t know where the other two are.